EDI File Settings in TheraNest are a set of check boxes that determine what information is included in your electronic claims. EDI File Settings are a common culprit in claim rejections. If you receive rejections stating that you are missing information from your claims such as the Rendering Provider or Service facility check out your EDI file Settings to see if they need to be updated. Note: The PDF version of the CMS-1500 in the client's ledger does not affect the electronic 837 file and the EDI File Settings do not affect the PDF version of the claim. 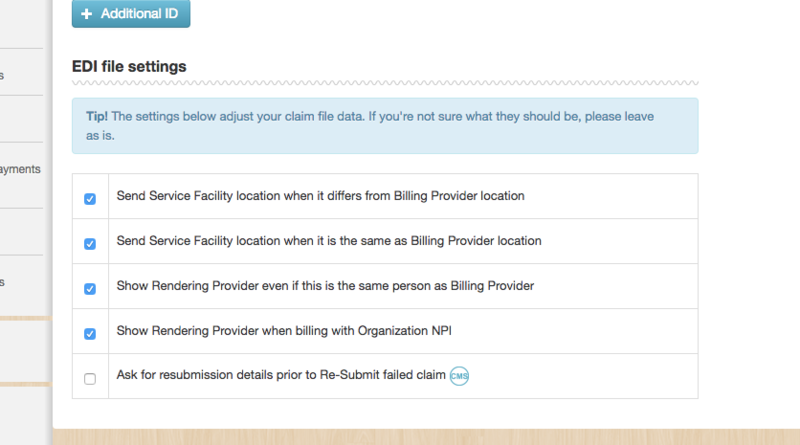 Each Insurer has their own EDI File Settings. You can see this by going to Billing > Insurers > Edit. By checking the first box you are stating that if the address in box 33 is different than the address in box 32 - the information in box 32 WILL be transmitted. If this box is not checked - the information in box 32 WILL NOT be sent. By checking the second box you are stating that if the address in box 33 is the same as the address in box 32 - the information in box 32 WILL be transmitted. By checking the third box you are stating that if the Rendering Provider in box 24 & 31 is the same as the Billing Provider in box 33 the Rendering Provider information WILL be transmitted. By checking the fourth box you are stating that if the Rendering Provider in box 24 & 31 is different than the Billing Provider in box 33 the Rendering Provider information WILL be transmitted. When the fifth box is checked you will be prompted to complete resubmission details when resubmitting a claim. This information populates box 22. You should only check this box if you know it is required by the insurance company.